Being popular manufacturer and exporter of wide range of stillages, we provide metal stillages to make available the easy and sturdy transporting solution for the variety of products belong to different industries. our metal stillages are extensively used for the holding and transporting different products with safe and sound manner, either it is of unusual shaped or difficult to handle products. It provides rigid welding and optimum quality material provides them extra ordinary strength. 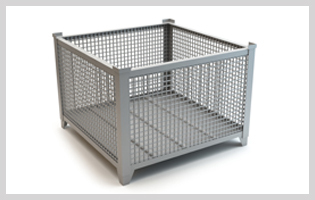 These rigid and long lasting metal containers are fabricated from reinforced metal sheets. Our experienced designers and expert engineers are able to provide perfect suitable solution for your specific requirements.